Christian Jankowski. Point of Sale, 2002. As collectors, we believe we are caretakers of art. We primarily support museums with works of art—in all media—that build or further expand collections. Without exception, our gifts and bequests are made without restriction. We entrust museums to access, manage and deaccess works of art in accordance with their needs and resources. Jankowski, Christian. Point of Sale, 2002. Three-channel video installation (1 Digital Betacam, 3 DVD), 14:17 min, PAL, 4:3, color, sound; edition of 5, II. Leckey, Mark. Are You Waiting, 1996. VHS tape, edition 1/5. Wilcox, T.J. Twenty-two films stills from: The Escape (of Marie Antoinette) (1995), The Death and Burial of the First Emperor of China (1997), Stephen Tennant Homage (1998), R-print from single 16mm film, sizes variable. Wilcox, T. J. The Escape (of Marie Antoinette), 1996. 16mm color film, sound, 11:30 min. loop; edition number 4/5. Wilcox, T. J. The Death and Burial of the First Emperor of China, 1997. 16mm color film, sound, 11:40 min. loop; edition 3/5. Wilcox, T. J. Stephen Tennant Homage, 1997, 16mm color film, sound; 13 min. loop; edition number 1/5. 5:55 min. (in German), 5:55 min. (in English), loop, edition 2/5. Rosen, Kay. The River, 1989. enamel sign paint on canvas. 16x 10 in. Rhoades, Jason. Swedish Erotica & Fiero Parts, #2, 1994. Vinyl table, F.O.G. Useless Ottoman, recovered bucket seat with sheepskin cover, Tyvek pants, paper carpet, cardboard re-surfaced coat rack, Tyvek jacket, 2 Sheetrock Furniture Kits (half-empty), Styrofoam model shelf (Judd), model builder's bench and more. The Escape (of Marie Antoinette), 1996. 16mm color film, sound, 11:30 min. loop; edition number 4/5. 2001 The National Gallery of Australia, Canberra (Parkes), Australia. Frank, Dale. The falls from memory, 1984. Synthetic polymer paint on canvas. 188.0 h x 132.0 w cm. Frank, Dale. Self portrait as the whimsical Dutch jug, 1982. Drawing in black pencil, sheet 110.5 h x 173.0 w cm. image 101.0 h x 167.0 w cm. Frank, Dale. Self portrait as floating prisims (sic), 1982. drawing in black pencil and color pencils on paper, sheet 70.2 h x 101.0 w cm; image 65.0 h x 96.0 w cm188.0 h x 132.0 w cm. In 2000, Clayton Press and Gregory Linn gave the Department of Cultural Affairs, City of Chicago an unrequested gift of 64 works of art, which they had acquired between 1980 and 1986. The gift also included a comprehensive archive personal papers; invoices, invitations and ephemera; publications and books, documenting the careers of artists who were active in Chicago between 1980 and 1985 and whose work was shown at Nancy Lurie Gallery, Marian Deson Gallery, Sonia Zaks Gallery, Peter Miller Gallery, Phyllis Kind Gallery and Zolla/Lieberman Gallery. 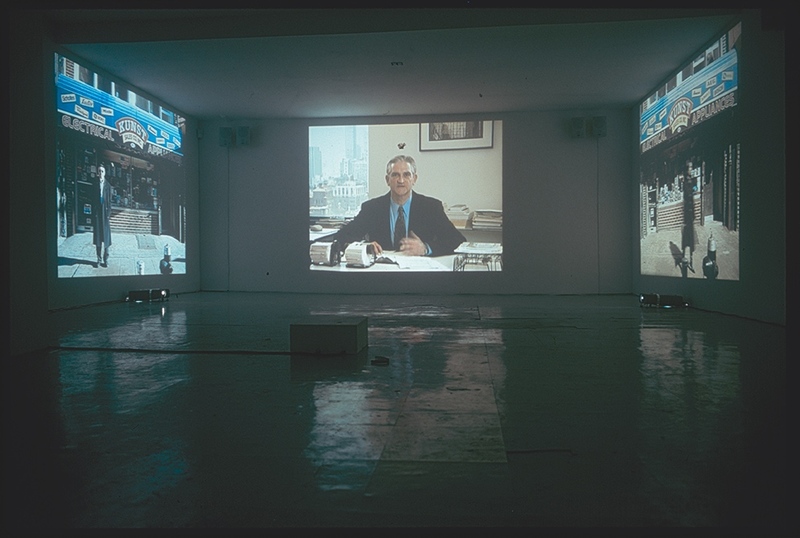 1999 The Whitney Museum of American Art, New York. Majore, Frank. Beyond the Reef, 1984. Silver dye bleach print, Sheet (Sight): 19 1/8 × 23 1/4 in. (48.6 × 59.1 cm) Frame: 21 7/16 × 25 1/4 × 1 3/8 in. (54.5 × 64.1 × 3.5 cm). Bernard, Cindy. Security Envelope (Mrs. Prina), 1987. Black and white photograph with mat and black painted frame. Frame (Black painted wood): 14 x 12 1/8 x 1 3/4 in. (35.56 x 30.8 x 4.45 cm)Image: 9 3/8 x 7 1/2 in. (23.81 x 19.05 cm); unique. Bernard, Cindy. Security Envelope (untitled), 1987. Black and white photograph with mat and black painted frame. Frame (Black painted wood): 14 x 12 1/8 x 1 3/4 in. (35.56 x 30.8 x 4.45 cm)Image: 9 3/8 x 7 1/2 in. (23.81 x 19.05 cm); unique. Syrop, Mitchell. Lift and Separate, 1994. Black and white photographs mounted on board. Each (9 panels): 23 3/8 x 19 1/2 x 1 in. (59.37 x 49.53 x 2.54 cm); unique. Tuymans, Luc. Untitled drawing. 1995. Becher, Bernd and Hilla. Silo for Lime, Duisburg, Ruhr District, 1972 (negative); printed later. Offset lithograph (4). Image (each): 15 11/16 × 11 13/16 inches (39.8 × 30 cm) Sheet: 20 × 69 inches (50.8 × 175.3 cm).